Howdy! This is proving to be a popular post; I’m glad folks have found it useful. If you’d like other useful stuff in your inbox without having to go search for it, click on the “subscribe” button on the right, and if you like useful stuff on Facebook, like us here! In the last post, we talked about the basics of ESPP’s, and I warned you that the tax situation warranted a post in and of itself. Well, here it is! With a few pictures, hopefully it will come clear. Let’s start with the basic diagram below. At this level, the tax situation is rather simple: the difference between the price at which you bought the stock and the price at which you sold it is income, and thus is taxed. Compensation (ordinary income): Part of your ESPP income is taxed as compensation, i.e. at your normal income tax rate. Short-term Capital Gains: If you held your shares for a year or less after you purchased them, the part of your ESPP income not taxed as compensation is taxed as short-term capital gains. Currently, that means they’re taxed at the same rate as compensation. Long-term Capital Gains: If you held your shares for more than a year after you purchased them, the part of your ESPP income not taxed as compensation is taxed as long-term capital gains. As of September 2017, that means they’re taxed at 20%, 15% or 0%, depending on your income. OK, that doesn’t sound so bad. So that means that all we have to do is figure out how much of the income is compensation, and we’re home free, right? Well, yes…and that’s the tricky part. There are two situations we need to go into: “disqualifying dispositions” and “qualifying dispositions”. Disqualifying Dispositions: If you did not hold your shares for more than two years after the “grant date” (beginning of the offering window; see previous post) and more than one year after purchasing them, this is a “disqualifying disposition”. In a disqualifying disposition, the difference between the amount you paid for the shares and the amount they were worth when you bought them — in other words, your discount — is counted as compensation income. The rest — the difference between the amount the shares were worth when you bought them and the amount they were worth when you sold them — is capital gains; long-term if you held the shares for more than a year after purchasing them, short-term otherwise. That’s good — more of your income is taxed at the (lower) long-term capital gains rate. But here’s a bizarre twist: in the following situation, you would actually pay more in taxes for a qualifying disposition than for a disqualifying disposition! Note that if this were a disqualifying disposition, your compensation income would be much smaller (look back at the second graph), and the capital gains much larger. Ouch — good things do not, apparently, always come to those who wait! So…now what? This theoretical knowledge is all well and good, but what we should actually do with our ESPP shares? Do we participate in our company’s ESPP, or no? Do we sell some or all of the shares immediately? How long should we hold on to them? I’ll discuss all of these questions in the final post in this series. Thank you for explaining this with diagrams! I get confused by all of the “what if’s” – Can you boil this down to a “if you do it this way you will minimize your tax liability”? Thank you! I would ask a different question. Rather than “what will minimize my taxes”, I would ask, “what will maximize the amount of money I get, for the least amount of risk?” The answer to that question is in the third part of this series. Is this valid only for disqualifying dispositions or even for qualifying dispositions ? I have shares acquired through an American company I was working for. They were purchased through the company ESPP plan. I was living and being paid in Europe at the time ( I am not a US citizen). 10 years later I have moved to the US full time and will be shortly selling these shares. Am I liable for US ordinary income tax on these shares, even though they were acquired while not a US tax payer? In the case of a qualified disposition where the plan has a “look back” feature, would the 4th chart still apply as drawn? 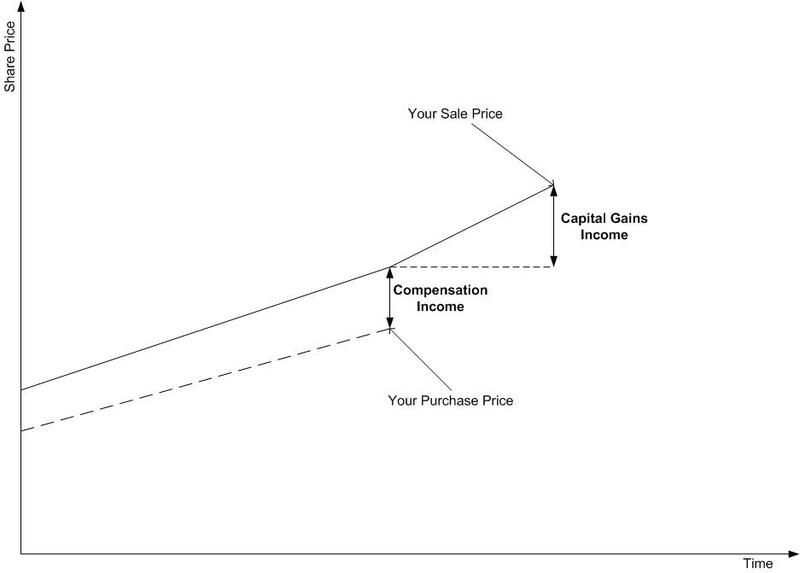 In this case, the bottom dotted line (represents purchase price) would stay flat and the discount at time of purchase would be quite large. Would you still only pay income tax on the grant date discount? And would long term cap gains be paid only on difference between FMV price at purchase time and FMV at sale time? It seems this could result in a significant tax savings. It may be worth holding ESPP stock if the stock gained significantly over the offer period (grant to purchase). 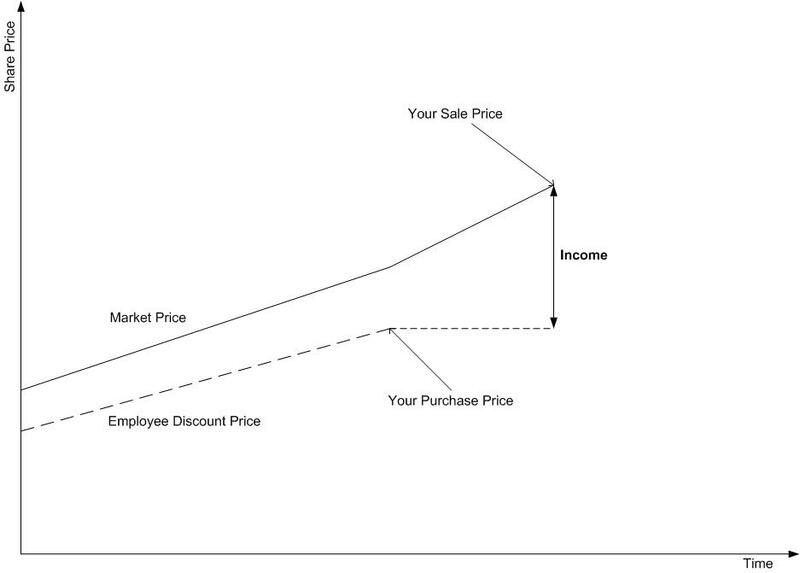 The dotted line represents the price you paid — period. And yes, if your company has a “look back” feature, the difference between the dotted line and the solid one could indeed be quite large! Yes, you’re right — waiting for a qualifying disposition *could* result in significant tax savings, per your example. It’s simply a matter of rolling the dice — wait and get the tax savings, gambling that the stock market in general and your company’s stock in particular hold out, or take a sure bonus. See the next article, https://financialgeekery.com/2012/05/29/the-ins-and-outs-of-espps-part-3-so-now-what/, for my recommendation. Thanks for the response. I have researched this some more and found examples. They indicate that, if the plan has look-back and the price of the stock rose over the offer period and you wait for the two years to become qualified, you will pay long-term capital gains on the amount between the sale price and the FMV at the grant date. Simple example: Let’s assume a plan with 15% discount that has look back. I’ll do this on a per-share basis. If stock is $10 at grant and $15 at purchase and you wait the two years and then sell when stock is at $20. In the qualified case, you will pay income tax on $10-$8.50 ($1.50). And you will pay long term cap gains on $20-$10 ($10). If we take the same example and assume disqualified status, it would be income tax on $15-$8.5 ($6.50) and cap gains on $20-$15 ($5). Assuming these examples are correct, your 4th chart changes quite a bit in the case of look back. 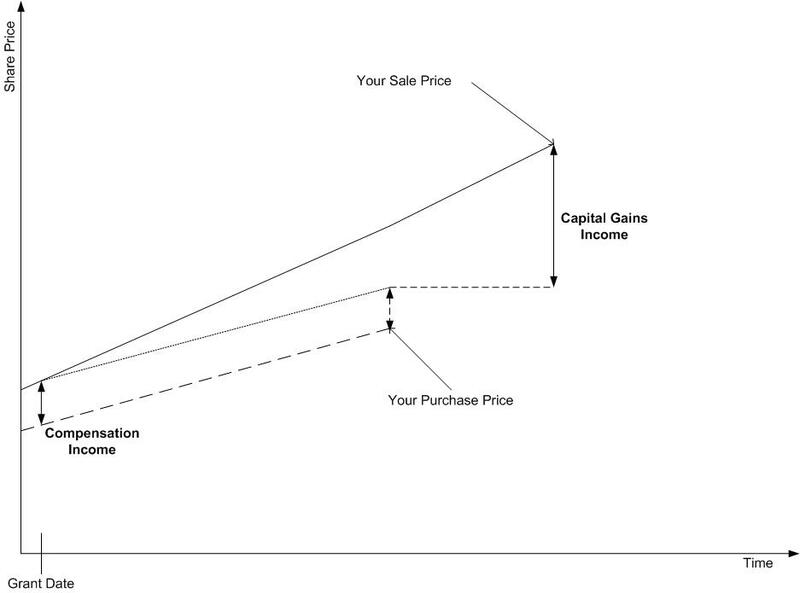 Not only does the purchase price dotted line stay flat, but the dotted line at the lower end of “capital gains income” will lower to the FMV on the grant date (sold line at left side of chart). Do you agree this is correct? In the case where you have a qualifying disposition, but the stock went down since you bought it so that you end up with an overall loss, you end up with zero ordinary income and a capital loss. You don’t get to recognize negative ordinary income! The sentence still applies that you can apply up to $3000 of that capital loss against your income. @stannius. Does it mean, whenever we have an ESPP loss, it is better and favorable to wait and sell, when it is a qualified disposition, so that we realize zero ordinary income tax, and all loss is captured in long-term-capital-loss? 1. Why in last two diagram we do have 2 lines besides one dash line? I am not sure what the second line (from top) represent? 2. The purchase price (at least in our company) is the minimum price of offering date and purchasing date. So I guess the diagrams need modification, correct? 1. I agree, qualified dispositions are confusing! The line that’s exactly parallel to the dashed line is my way of trying to track your compensation income. You can ignore that line and just focused on the dashed line with arrows. The other solid line represents the actual stock price. 2. In your case, this just means that the dashed line is flat when the stock price is higher at the purchase date than the grant date. Even better! My question is about the qualified disposition when price has been monotonically increasing — the 4th graph. If the Ordinary income is “Discount on Grant date” and long term capital gain is “Sale price – FMV on Purchase date” when did IRS never tax the “FMV on Grant date – Purchase Price” amount? Or would the capital gain be “Sale price – FMV on Grant Date”? I assume a case where price is increasing, i.e. 4th graph v/s 5th graph. Total income = “what you sold it for” minus “what you paid for it”. 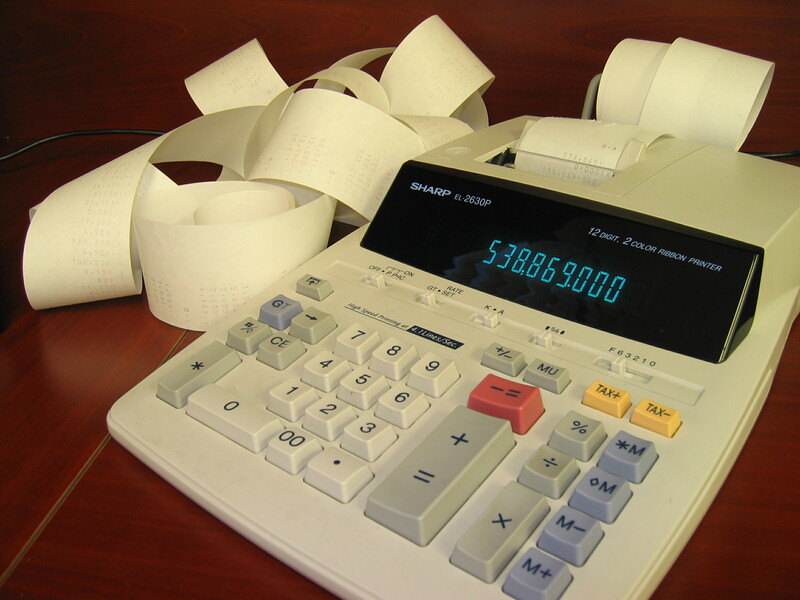 The grant date discount is the portion of that which is compensated as ordinary income. The rest of your total income is taxed as capital gains. Does that make sense? Yes it does, and that is what I was hoping for. 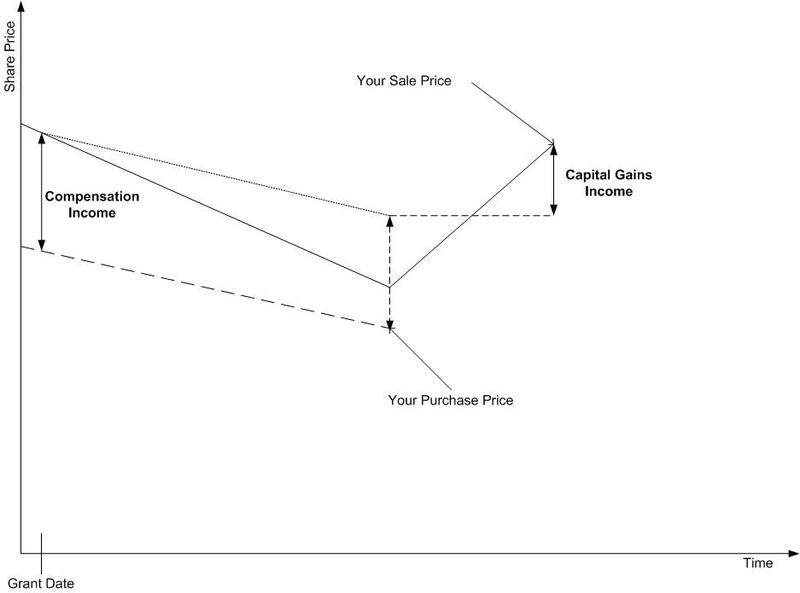 To me, the 4th graph seems to suggest that Capital gain is “Purchase date FMV” – “Sale Price” since the lower end of the “Capital Gains” arrow is at the “Purchase date FMV” instead of at the “Grant date FVM”. But I’m good now. I am confused, but I’m giving it my best shot. Lets say my company does not offer a Look-back option. The stock price when granted is then higher than the price at purchase date, however the Purchase Price is calculated at the Grant Date, we would then be in a situation where the taxes would actually be lower if we did a disqualifying distribution. Math looks right to me. Compensation income on the qualifying disposition is equal to the lesser of (grant FMV – grant price) or (FMV on date of sale – grant price), in this case the former, and the rest is long-term capital gains. In the case of the disqualifying disposition, the compensation income is equal to (FMV on purchase date – grant price), and the rest is long-term capital gains. His math is a tiny wrong. (10-8.5)*10=$15. and (9-8.5)*10= 5. Unless I have some wrong idea of what is being represented. I know this was blogged many years ago. But I’m particularly interested in different tax scenarios with ESPP plans with look back provisions. Generally, I understand it’s a decent idea to just sell as soon as the purchase is made. However, in the case where I’ve already held onto these stocks, I’m trying to judge whether to wait out the 1 year disqualifying/long term cap gains date, or the 2 yrs from grant qualifying/long term. The stock value has grown nicely, but my ownership has not reached either of these horizons. You should sell the stock at its peak. (Sorry, I couldn’t resist. But you see the issue, right? The future of a given stock’s price is notoriously difficult to predict. You could wait, but then you’re taking what was guaranteed income and gambling with it. 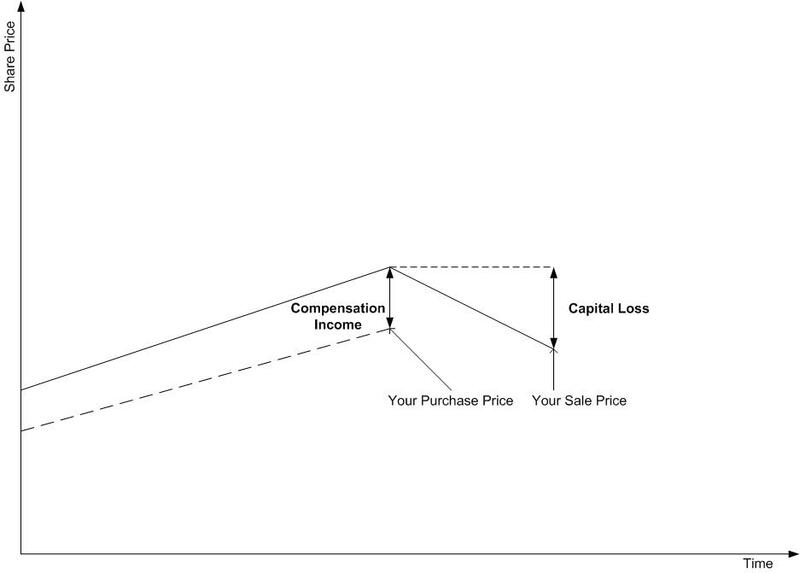 Question – in the last scenario where the stock price drops and then rises again, you note that if it were a disqualifying distribution, there would be LESS taxed as comp income and MORE taxed as capital gains income compared to if you sold it as a qualifying disposition (your “bizarre” scenario example). This may be true, but if you sell it as a disqualifying distribution, even though a larger portion would be taxed as capital gains, it would still be SHORT TERM capital gains which is the same as comp income. So therefore it is still favorable to wait at least a year and sell it as a qualifying disposition, no matter the scenario. Because you would at least be getting some portion taxed as a LT capital gain as opposed to a ST capital gain. Good question! Actually, it’s possible to have a disqualifying disposition that still receives long-term capital gains treatment. Recall that a qualifying disposition must be more than two years after the grant date AND more than one year after the exercise date. Long-term capital gains treatment just requires the latter. So if you were granted ESPP shares today, exercised six months later, and sold a year after that, you’d be eligible for long-term capital gains treatment but NOT qualifying disposition treatment. In order for it to be a qualifying disposition, you’d have to wait an additional six months, which would end up being two years after the grant date and 18 months after the exercise date. Got it! I realized this after I posted. Thanks for the info. This is an awesome article!